Quantum of the Seas visited Southampton last week, following by just sixteen days a similar visit by her larger fleetmate Oasis of the Seas. While Quantum departed yesterday for New York, we have a look at how she compares with Queen Mary 2 and we update readers on the changes effected to Oasis during her drydocking in Rotterdam. With today’s news that the 1,450-berth CMV Magellan is about to join Cruise & Maritime Voyages on charter from Costa Cruises Group, we also have a look at the health of the European market for smaller more traditional ships. With her recent delivery from Meyer Werft and pre-inaugural mini-cruises from Southampton over, the Quantum of the Seas sailed on Sunday with more than 4,000 passengers on an 8-night crossing to New York. Her sister ship Anthem of the Seas will make a similar crossing next year, on October 27. But on the subject of Quantum of the Seas, her most interesting lounge has to be the Two70, which overlooks the ship’s stern and gives views around 270 degrees. No newly-built ship has included this feature since Orient Line’s Oriana in 1960. The difference is not only the height – the Two70 lounge is massively high as opposed to just one deck – but also the entertainment that has been made possible by the installation of a sequence of moving robot screens. 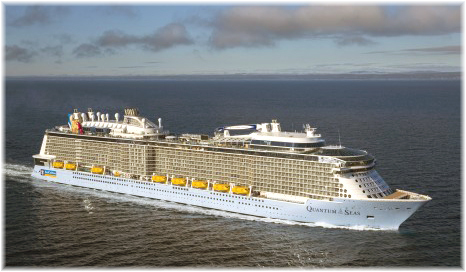 One problem with the Quantum of the Seas is that although she will be New York-based for six-months, tests last year determined that, unlike Norwegian Cruise Line’s 4,028-berth Norwegian Breakaway, Quantum is too large to be able to serve Bermuda without further dredging. This may have something to do with why it has been decided to allocate her to run year-round from Shanghai after she finishes her first six-month season from New York. This will also give Royal Caribbean more time to work with Bermuda to ensure that one of her upcoming sister ships will be able to berth at Bermuda’s Naval Dockyard in 2016. Meanwhile, while Royal Caribbean has opened a new berth to accommodate Quantum class ships at New York’s Cape Liberty terminal, the 3,634-berth Liberty of the Seas will be brought in to serve Bermuda in 2015. Other stories prevented us from reporting on the recent makeover of the 5,408-berth Oasis of the Seas but now that she and her fleetmate Quantum of the Seas have both visited Southampton and departed for the US, now is be a good time to bring readers up to date on the results of her recent five-year drydocking in Rotterdam. 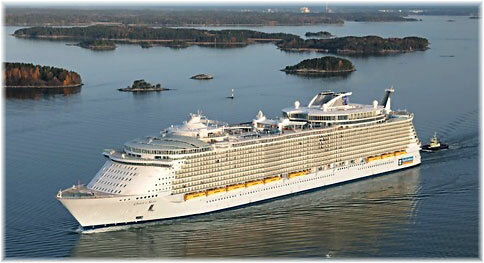 Oasis’s visit to Southampton made her the largest passenger ship ever to have called on that port, by a margin of 40%. One of the less obvious results was the addition of forty more staterooms, with two more Royal Suites, four Grand Suites, one Suite, five Balcony staterooms, five Outside staterooms, and a surprisingly high number (twenty-three) Inside cabins, the latter all inserted into excess space or the site of former restrooms. If the old rule-of-thumb of each extra stateroom being worth an extra $100,000 in annual revenue, that should improve the ship’s earning potential by an additional $4 million a year, not including anything spent on board. But most shocking to many Royal Caribbean fans is that the Viking Crown Lounge has been removed in favour of a Suite-only lounge and another alternative dining venue, making her the first Royal Caribbean ship ever not to feature a Royal Viking Lounge, which has always been a trademark of their ships. Many other changes involve the restaurants. Izumi, for example, has been moved below and the former space on deck 16 incorporated into the Windjammer Café. On the lower decks 3,4 and 5, the former Opus Dining room spaces have been converted into Silk, The Grande and the American Icon Grill, while the portside private dining is now Izumi, starboard side the Diamond Club and the Seafood Shack is now Sabor. Shops have also changed, with Focus being converted to a Michael Kors and Guess to Regalia. Oasis also offered a Transatlantic crossing last month, in her case a 12-night crossing that left Southampton on October 15 and arrived in Fort Lauderdale last Tuesday with more than 5,000 passengers on board. The cruise reviews for this voyage were less than unanimous, with reports of crowds and waiting as well as the unsuitability of such a large ship for Transatlantic voyages, so we hope Quantum of the Seas does better. Oasis performed a short season from Barcelona this year that sold out but sister ship Allure of the Seas will be based there for a much longer season of twenty-five cruises in 2015. While Allure will also embark passengers at Civitavecchia, it is expected that she will handle 158,000 passengers at Barcelona alone. There have been many changes in the realm of small and traditional ship operations in the UK and Germany over the past couple of years. Transocean Cruises, with its 590-berth Astor, has become the third ship in the fleet operated by the UK’s Cruise & Maritime Voyages, which is itself part of the Piraeus-based Global Maritime Group. 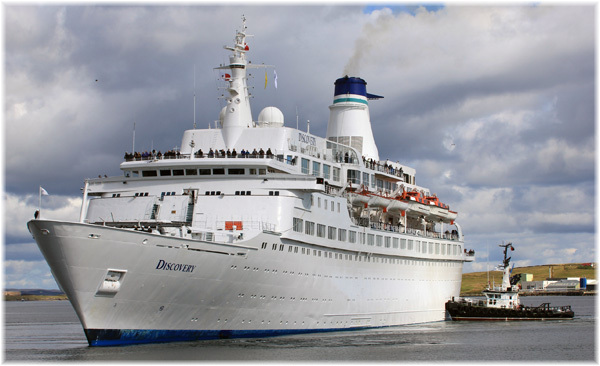 Voyages of Discovery’s 710-berth Discovery, which had been working for Cruise & Maritime Voyages, has been sold for $5 million, and is now bound for scrapping. There has also been speculation as to what might happen to her fleetmate, the 556-berth Voyager, now that she is an even smaller ship operating alone, although the same owners, All Leisure, have just done a rebranding for Voyages of Discovery and still control Swan Hellenic’s 380-berth Minerva and the 50-berth Hebridean Princess. Partly to replace the Discovery, Cruise & Maritime Voyages picked up charters on Portuscale Cruises 493-berth Funchal and 556-berth Azores in 2014, while the latter will return to replace the Discovery full time in 2015, operating along with Cruise & Maritime’s veteran, the 50-year-old 848-berth Marco Polo. Today, however, came news that beginning in 2015, Cruise & Maritime Voyages will charter the 1,450-berth Grand Holiday from Costa Cruises Group, and will operate her as the CMV Magellan. The maiden voyage will be a 12-night cruise from Tilbury to Iceland and the Faeroes, departing March 15, 2015, for the Solar Eclipse and Northern Lights. She will also cruise from Newcastle-upon-Tyne. This ship, which was Carnival Cruise Lines’ second newbuilding, was built in Denmark and delivered in 1985 as the Holiday. Following the Tropicale of 1982, which had traditional internal promenades along both sides of the ship, the Holiday was the first ship to adopt the starboard-side only promenade from the Viking Line ferries that operated between Helsinki and Stockholm and has been included in every Carnival ship built since. With the addition of the CMV Magellan, Cruise & Maritime will move the Azores to a summer season out of Liverpool and Marco Polo will add a second long cruise to Canada. 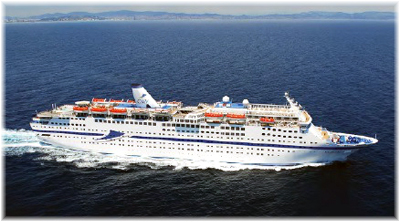 And in a first fro Cruise & Maritime Voyages, they will offer Mediterranean fly/cruises in the Azores next autumn. 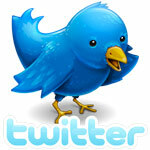 Back in Germany two more small ship operators have closed while a third is in trouble. Passat Kreuzfahrten, who chartered the 474-berth Delphin from India-based Vishal Cruises, closed in September, and Berlin-based Ambiente Kreuzfahrten, which had been using the Azores, has also closed. Last week, ms Deutschland GmbH, owners of the 552-berth Deutschland, went into voluntary administration and are trying to seek adequate finance for the ship’s drydocking and continued operation. 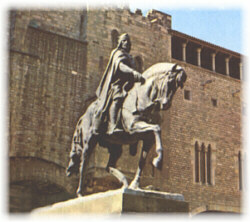 There are five other operators in this market in the UK and Germany, as well as Portuscale Cruises in Lisbon. In the UK, Fred Olsen Cruise Lines operates four ships ranging from 804 to 1,747 berths while Saga Cruises’ two ships offer 456 and 706 beds each. In Germany, there are three more operators. Phoenix Reisen operates three ships of between 594 and 1,176 berths, FTI’s Berlin has 412 lower berths and Plantours’ Hamburg 400. All told, this constitutes a fleet of almost a dozen ships in the more traditional (and popular) size range between 400 and 1,750. Despite a number of ships leaving and companies in trouble it appears there is still enough interest in this market to attract additional ships, as evidenced by today’s news on the CMV Magellan. The question will be who are the survivors.